Proceedings of the Twenty-Second Vertebrate Pest Conference, (VPC-2006). Published at the University of California, Davis, Published October, 2004 372 pp. ISSN: 0507-6773. 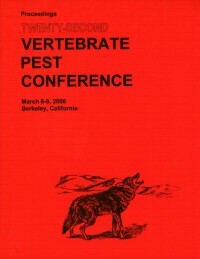 Proceedings of the 21st Vertebrate Pest Conference (VPC-2006). March 1-4, 2004. Berkeley CA, arranged by the Vertebrate Pest Conference. Editors Robert A. Timm and John M. O'Brien. Description: Kangaroo Island, South Australia, Contraceptive Effect of a Recombinant GnRH Vaccine in Adult Female Pigs and Lyme Disease in California: Ecology and Epidemiology.